Geodes are rocks with a secret inside. On the outside, they look like plain old rocks, but their hollow insides are covered in crystals of different minerals. Geodes around Arizona contain mostly Amethyst. These break open geodes are for people who want to have a little adventure on their own. To open the geode, all you do is leave it in the supplied bag and hit it with a hammer. 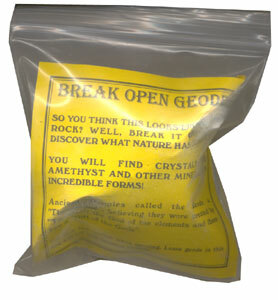 The Geode kit comes with one large geode and a descriptive sheet. It is important to be careful when opening geodes, of course. The geode kit that gets shipped to you might have a descriptive sheet of a different color than is shown here, but it will carry the same information. The contents inside the geode is not affected by what color sheet you have, nor does the sheet index the hardness of the rock.